It's quite funny how sometimes you just don't wear certain pieces of clothes. This month, I haven't been wearing jeans a ton. Except this past weekend, it was pretty much all I wore. On Saturday, I went for a simple look that I love to wear; jeans, tee, and blazer. There are so many different styles that these items come in (edgy,chic,classic...). For me, I tend to stay in the more classic/chic range. 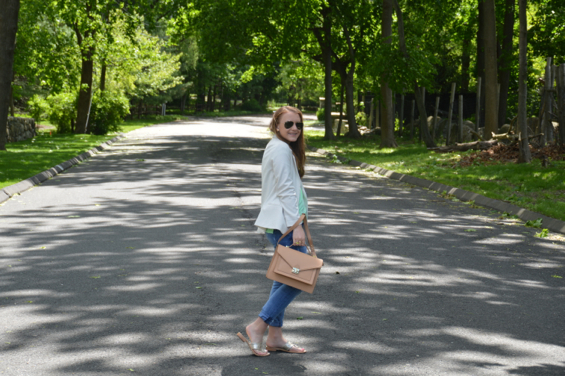 A summery color palette was necessary, along with some of my favorite neutral accessories. I wore a bright Splendid tee, that is insanely soft! Distressed jeans add instant edge to any look. I topped the look with a crisp, white blazer to make the weekend look more streamlined. The blazer was such a good deal and I definitely need to get more wear out of it! See below for more easy jeans/tee/blazer picks! This is such a great example of how classic, basic pieces can look so good together! Love the color of that tee! Thank you! I love the tee too! I also usually stay in the classic/chic category of style. I love this outfit. It's perfectly casually chic. Love the pretty color palette! so cute! i am a sucker for jeans, a tee and blazer. you can never go wrong.